Manoharan Varadarajan, 48, lives in Chennai with wife Vijayalavanya (39), children Nivedha (18) and Harshith (15), and Manoharan's father and mother, aged 74 and 64, respectively. 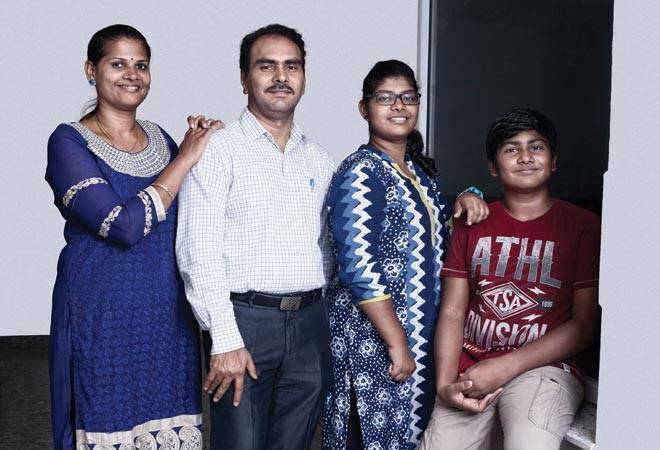 Both Manoharan and Vijayalavanya are engineers and keen to plan their finances to make sure that the family is on the right track to meet all essential financial goals linked to a comfortable retirement, children's education and marriage, and vacations. Healthcare for parents tops Manoharan's priorities at the moment as they do not have any health insurance. He also wants to build an education and marriage corpus for his children at the earliest. His monthly income is around Rs 2.3 lakh, but the family has inadequate health cover and solely depends on employee health insurance. They do not have an emergency fund either, which must be in place to meet urgent or unforeseen expenses. Based on their risk profiles, a balanced investment portfolio could generate an 8.8 per cent return per annum after taxes and fees. During the planning, the life expectancy of both spouses is kept at 80 years. A general inflation rate of 8 per cent per annum has been factored in as well in line with long-term inflation trends although recent inflation data points have been much lower. Education inflation is kept at 12 per cent per annum, which is significantly higher than general inflation, and medical inflation is projected to be 15 per cent per annum. Our analysis indicates that Manoharan has planned well for the future and can achieve all his financial goals, including an emergency fund, healthcare for dependent parents, education for the children as well as their marriage expenses and partially his retirement. If he invests his current and future surpluses every month in a disciplined and systematic manner till retirement, he is very likely to achieve his full retirement corpus as well. 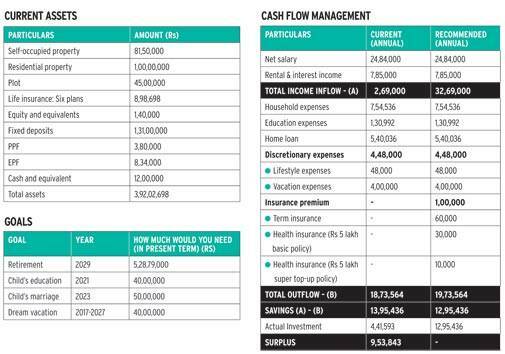 Here is what he needs to do to stay on the right track (see tables Goals and Cash Flow Management). Contingency fund: Manoharan is advised to keep a contingency fund that equals six-nine months' expenses before starting investments for future goals. His existing cash in hand and cash at bank amounting to Rs 12 lakh has been allotted for this purpose. The money should be invested in fixed deposits (FDs) or liquid and short-term debt funds. Parents' healthcare: As his aged parents are dependent on him, Manoharan should keep a corpus of Rs 5 lakh for their healthcare expenses. His existing FDs are aligned with this goal. Insurance: Life cover: The couple has insurance cover, but it is not adequate, and insurance must not double up as an investment. Manoharan's employer also provides a term plan worth Rs 63 lakh. But in case of job loss or a change in the company's policy, this cover will not be available. Hence, he should buy a plain term plan worth Rs 2.40 crore for 11 years, which will cost around Rs 60,000 per annum. After analysing his existing insurance policies (see table Current Assets), he is advised to continue with the LIC policies as he has already paid most of the premiums and the policies are going to mature in the next few years. As for the ULIP Policy, there are limited options at this stage as these policies typically come with a lock-in period of five years. However, he should ideally refrain from mixing insurance and investment products due to lesser flexibility in making changes, if required. Health cover: Manoharan has a group insurance cover of Rs 3 lakh for the family and a personal accident policy of Rs 63 lakh, both provided by his employer. He, however, does not have any other health insurance, which is not advisable. As the company cover is not adequate and will be withdrawn if he loses his job or leaves the firm or the policy changes, he should buy an independent health insurance for the entire family. It should include a floater plan (Rs 5 lakh) and a super top-up policy (Rs 5 lakh) with a deductible of Rs 5 lakh. Premiums will be around Rs 40,000, and there will be additional income tax benefits under section 80D. Manoharan should also consider other risk management tools, for instance, a critical illness cover and a personal accident policy that covers disabilities - both temporary and permanent. Children's education: To build an education corpus of Rs 40 lakh by 2021 at today's value (it will be around Rs 64.94 lakh by the time the target year is reached), Manoharan's plot of land worth Rs 45 lakh must be liquidated right away, and the proceeds should be equally reinvested into equity and debt mutual funds. Other existing investments that can help fund this goal include LIC Jeevan Anand, LIC Money Back and LIC Komal Jeevan policies. Children's marriage: For a marriage corpus of Rs 50 lakh by 2023 at today's value (the target year value will be around Rs 79.34 lakh), some proceeds can come from selling the plot of land, which will again have to be equally reinvested into equity and debt mutual funds. The rest will come from Manoharan's current investments in two mutual funds, his equity stock portfolio, current FDs (assumed reinvested into other fixed-income portfolios after three years) and money from another LIC Jeevan Anand policy that is going to mature in 2023. Retirement: A corpus of Rs 5.28 crore will be required for this purpose. It can be funded by Manoharan's public provident fund (PPF) and employees' provident fund (EPF), LIC Jeevan Saral policy, ULIP, FD proceeds, rental income from the investment property of Rs 1 crore and the entire cash flow surplus, which will be generated every year. This cash flow surplus should be invested in a combination of equity and debt mutual funds along with some exposure to gold through Sovereign Gold Bonds. Vacation: Manoharan is keeping aside Rs 4 lakh a year, which he should continue for the next 10 years. Investment planning: The two mutual funds that Manoharan holds are not ideal choices. He has significant exposure to mid- and small-cap stocks, which are overvalued from a historical price-to-earnings perspective and not in line with his risk tolerance. There could be exit load and tax implications as these funds are relatively new. So, he should only hold these investments till it is the right time to exit. As he has a small direct equity portfolio and direct investments in stock markets, which require in-depth research and analysis, he must track the stock portfolio closely or use managed solutions such as diversified equity mutual funds. The surplus amount available from investment should be put in equity and debt mutual funds through SIPs. Loan planning: Manoharan has taken a home loan and is paying Rs 45,000 a month for it. While the effective loan rate over the loan period is fairly low, he should try and prepay the loan as the rate of interest is higher than or close to the rate of interest earned on his FDs. He should prepay the pending loan amount from his FDs and invest the monthly instalment he used to pay. Thus, investments can be around Rs 1.12 lakh per month, including the surpluses available after prepaying the loan, which will enable him to achieve all family goals. Real estate planning: The family's exposure to real estate is 47 per cent of the total wealth (see table Asset Allocation), excluding the self-occupied residential property. As their exposure to real estate is significantly overweight and land is a difficult asset class to manage, protect and liquidate, it is strongly recommended that the family should immediately sell the land worth Rs 45 lakh. Post that they can invest the proceeds into financial assets, which can be later used for children's education and marriage. Gold/other asset planning: Investments in gold through Sovereign Gold Bonds and enhanced exposure to equity and debt mutual funds through systematic investment plans or SIPs should be considered as well. 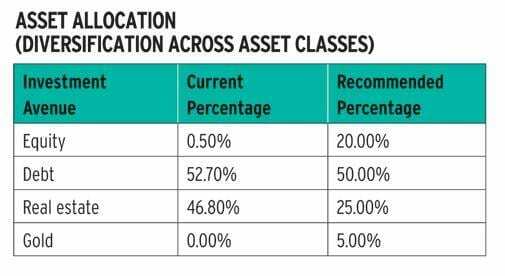 Tax planning: Considering that Manoharan is in a high tax bracket and does not require too much liquidity at this stage, he should opt for as many tax-efficient instruments as possible for his fixed-income portfolio. These could include debt mutual funds and tax-free bonds. The couple could also consider investing more into PPF, Voluntary Provident Fund and National Pension Schemes, considering the tax efficiency of these instruments compared to bank FDs. The financial plan is presented based on the information and details provided by Manoharan Varadarajan. He is further advised to review the plan and rebalance his portfolio periodically, preferably every year. If you need help on how to manage your money and want expert advice, write to moneytoday@intoday.com.